WEST PALM BEACH, Fla. (February 21, 2018) – Crossman & Company, one of the Southeast’s largest retail leasing, property management and investment sales firms, has negotiated the sale of Trump Plaza Office Condo in West Palm Beach for $1.2 million. The fifth-floor office condos consist of 3,998 square feet plus 1,010 square feet of covered balcony and 882 square feet of open balcony. 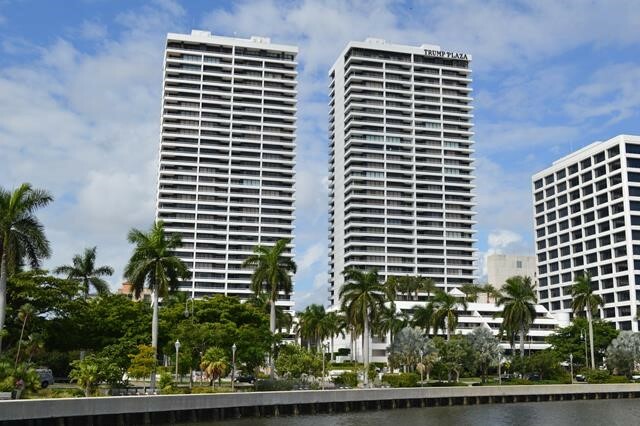 Trump Plaza Office Condo is located at 525 South Flagler Dr. with amazing views overlooking the Intracoastal and Palm Beach Island. Crossman & Company Senior Associates Kim and John Fitzgerald represented the seller. The office condo was built in 1985 and is centered between Okeechobee Blvd. and Clematis St. Judge May and Sotheby’s International Realty represented the buyer. Serving Florida, Georgia, Alabama, Tennessee, South Carolina, North Carolina, Mississippi and Virginia with offices in Orlando, Tampa, Miami, Boca Raton, Fla. and Atlanta Ga., Crossman & Company has experience in retail and office leasing, property management and investment sales of shopping centers, single-tenant, triple-net assets, as well as mixed-use and lifestyle properties. For more information contact Kim Fitzgerald at 561.447.8883, kfitzgerald@crossmanco.com, or John Fitzgerald at 561.447.8948, jfitzgerald@crossmanco.com. Visit www.crossmanco.com.